One of the greatest challenges a small business faces is transitioning from its startup phase to being an established, high-performing second stage company. It is not for the faint of heart. The changes in strategy, organization and culture are often profound. But the rewards can be dramatically positive for all of the key stakeholders: owners, employees and clients. NanoSpective, Inc. certainly found that to be the case when it made the transition to its second stage of growth with assistance from the Florida SBDC at the University of Central Florida (UCF). The company was founded by four UCF PhDs in 2003, with initial assistance from the UCF Business Incubator and the Florida SBDC at UCF. Based upon what they had studied in school and then used in corporate America, they innovated with a heavy emphasis on client service. The company grew to be a profitable business but, like most startups, hit a wall where growth was harder and harder to come by. It was then that NanoSpective turned again to the Florida SBDC at UCF and its consultant Roger Greenwald. 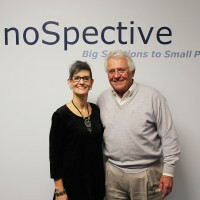 At no cost to the company, Greenwald and the Florida SBDC team were brought in to help NanoSpective make the transition to being a second stage growth company. They assisted by helping to develop a strategic growth plan, providing financial analysis, giving marketing and business development direction and offering guidance on organizational structure and development. "Our experience with the FSBDC has been fabulous. Roger Greenwald has been immensely helpful to us. While it wasn’t easy and required extremely delicate navigation, we have transitioned successfully to a single-owner company with a unified vision and strong corporate culture. We are fortunate that the two other owners chose to remain to do what they love: be great scientists. We have developed a Nanospective ‘Way’ focused on both our clients’ and our employees’ success. And we have achieved superior business results, delivering an average of 25% revenue growth year over year and adding 9 new employees to meet the needs of our clients." - Brenda Prenitzer, President and CEO - NanoSpective, Inc.